In Moldova, changes to the electoral system are afoot – but the motivations seem far from democratic. The Moldovan capital of Chișinău sees protests again, after a controversial proposal to introduce a mixed electoral system. 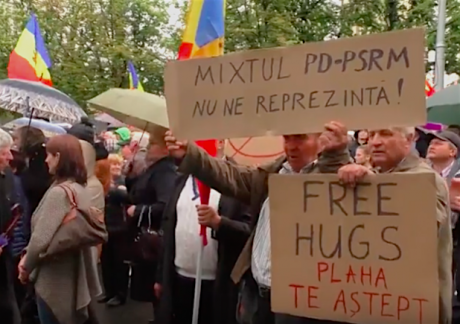 “The PD-PSRM mix doesn’t represent me!” and “Free hugs; Plahotniuc, I’m waiting for you!”, read these placards. Image still via Radio Europa Liberă / YouTube. Some rights reserved. It’s favourite move of dictators and autocrats everywhere: change the rules of the game once you start losing support or approach the legally mandated finish line. The post-Soviet space abounds in cases where heads of state overstay their terms in office. Until recently, Moldova stood out as a model of democratic transformation among the Commonwealth of Independent States. However, my country’s glory was short-lived. Despite high expectations about Moldova’s initial successes on its path towards European integration, embodied by the signing of the association agreements and a visa-free regime with the European Union, powerful actors have begun to hollow out the country’s democracy. Media freedom is being curtailed through a concentration of ownership and, as a result, political pluralism is withering away. The most recent innovation, a dubious call for electoral reform, is just latest sign of a democracy in deep decline. Moldovans still overwhelmingly despise the country’s most powerful man and oligarch-in-chief Vlad Plahotniuc, who also leads the ruling Democratic Party. Not even an alleged assassination plot in December 2016 could sway the public’s contempt. Yet Plahotniuc is relentless in his self-rebranding effort, desperate to turn himself from crooked oligarch into a respectable politician — one worthy of being the standard-bearer of European values at pinnacle of state power. After eliminating his arch rival ex-Prime Minister Vlad Filat by having him imprisoned on corruption charges in a textbook display of selective justice, Plahotniuc emerged as the most powerful man in Moldova. His personal grip on power was first tested during the presidential elections in October 2016. 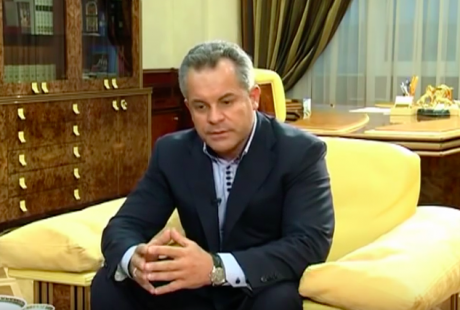 Moldovan oligarch Vlad Plahotniuc gives an interview for discussion show VIP Confidente, October 2014. Image still via YouTube / Prime TV. Some rights reserved. Fearing the victory of pro-European anti-corruption crusader and leader of the Action and Solidarity Party Maia Sandu, Plahotniuc colluded with then leader of the Party of Socialists Igor Dodon. Despite Plahotniuc’s brandishing pro-European credentials, many believe he helped the pro-Russian Dodon to become president. The parliamentary elections of 2018 will determine the country’s future — and Plahotniuc’s fortunes. Whatever their views on foreign policy, Plahotniuc and Dodon coordinate their domestic actions rather well. After having initially proposed a mixed electoral system back in 2012, Plahotniuc reintroduced the idea in March 2017, but this time in the form of a purely majoritarian (first past the post) system. Faced with massive opposition from all major political forces, Plahotniuc had to call in a favour. An indebted Dodon surprised many of his supporters by suddenly proposing a compromise in the form of a mixed electoral system on 18 April. Without further ado, on 5 May, in violation of legislative procedure, Moldova’s parliament rushed the bill onto the agenda, making the first step towards changing the country’s electoral system. The compromise bill, which combined Plahotniuc and Dodon’s proposals, taking the latter as a starting point, envisages a mixed electoral system under which 51 MPs will be elected under the current closed list proportional system, while the other 50 will be elected if they get a plurality of votes in single member districts. Candidates will require 600 signatures to register. Igor Dodon proposed that 25 MPs represent Moldova’s diaspora (as many as 700,000 Moldovan citizens live and work abroad; their remittances are immensely important to the country’s struggling economy) and Transnistria (a breakaway state on Moldovan territory which receives Russian economic and military support). Transnistrian leader Krasnoselskii earlier rejected Dodon’s proposal (link in Romanian), saying that five or six MPs would not suffice, and that residents of Transnistria would not participate in thes election anyway. Clearly, Dodon seeks to increase his potential electoral pool, but this will not go well with Plahotniuc, whose party’s base is primarily in Moldova proper. Needless to say, things are still in flux and the second reading will bring major amendments. Even more importantly, the highly contentious issue of drawing the electoral districts by the Central Electoral Commission is left for after the bill is enacted. As expected by most analysts, Plahotniuc dropped his own bill and backed Dodon’s compromise solution, formally ensuring a “consensus” as was suggested by the Venice Commission, which advises on constitutional law for the Council of Europe. At the end of the day, the mixed electoral system compromise was approved on the first reading with 74 votes out of 101 (link in Romanian). But there’s more to this decision than meets the eye. “Look at all those constituencies” Igor Dodon visited Moscow in January to meet Vladimir Putin. 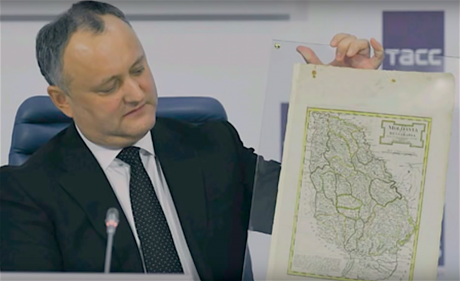 His hosts presented him with an 18th century map of the area now comprising Moldova. Image still via YouTube/TASS. Some rights reserved. Of the 74 lawmakers who voted for the controversial legislation, 31 are defectors from the Liberal Democratic and Communist parties. The two factions fell victim to a hostile takeover at the hands of the Democratic Party, whose faction grew to 42 legislators from the initial 19 seats won in the 2014 election (link in Romanian). Plahotniuc had previously relied on 13 seats belonging to his junior coalition partner, the Liberal Party. When the Liberals refused to support the change of the electoral system, Plahotniuc skillfully replaced them with a group of Liberal Democrat defectors headed by former Prime Minister Iurie Leancă. It was Leancă who led the cabinet during Moldova’s infamous “billion dollar scandal”, and his controversial decisions back then leave him open to blackmail and pressure from Plahotniuc, who enjoys control over the country’s judiciary and law enforcement. It’s clear that Plahotniuc’s majority in parliament is illegitimate — it does not reflect the will of the people expressed in the 2014 election. No surprises, therefore, that Plahotniuc had to go to great lengths to create the image of mass public support for his proposal. He has waged a large-scale media campaign, as well as a petition — and claims to have collected some 850,000 signatures. Yet after all this effort, the oligarch finally had to relent, and bring the Socialist opposition on board in order to give a modicum of legitimacy to his undertaking. Together, the Democratic Party and the Party of Socialists are only backed by about half of Moldova’s electorate. Recent polls indicate that the other half of the voters support opposition parties. On 12 April, five major opposition parties (Party of Communists, Liberal Democratic Party, Action and Solidarity Party, Dignity and Truth Party, Our Party) signed a declaration against the bill proposed by Plahotniuc. A no less strong response came from leading figures in Moldovan civil society, who addressed an open letter to the European Commission. In Brussels, the European People’s Party (EPP) and Alliance of Liberals and Democrats for Europe (ALDE) have already voiced opposition to the proposed changes. This show of unity among fierce political rivals may have indeed forced Plahotniuc to “activate” Dodon, who provided the necessary reinforcements in the form of his mixed electoral system compromise proposal. In my view, one would have to be blind not to see the hand-in-hand cooperation between Plahotniuc and Dodon. The absurdity of the situation is that Dodon continues to claim that he only proposed the compromise in order to put pressure on Plahotniuc and prevent him from enacting a fully majoritarian system. Dodon is being disingenuous, to say the least. Without the Socialist Party deputies, Plahotniuc cannot attain the pretence of consensus demanded by Moldova’s western partners. Even more importantly, any change of Moldova’s electoral system could require amendments to the constitution, which Plahotniuc can only achieve with Dodon’s help. 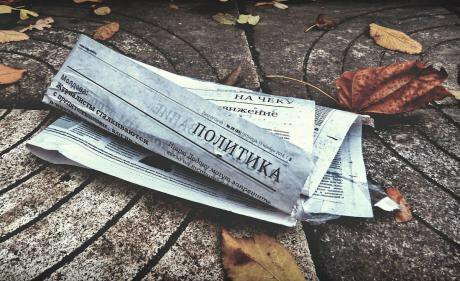 Yesterday’s politics, and tomorrow’s: Moldovans have been unlucky with their post-Soviet leaders. Will their fortunes ever turn for the better? Photo CC-by-NC-2.0: Micagoto / Flickr. Some rights reserved. So what’s in it for Dodon? The current proportional system benefits the Party of Socialists the most, as it enjoys the highest popular support of any single party. With Plahotniuc in control of administrative resources, mass media and the gerrymandering process, a mixed electoral system reduces the chances of a Socialist Party majority in the next parliament. If Dodon is vulnerable to blackmail by Plahotniuc of any kind, this should make his backers in Moscow worried about the return on their investment. As of yet, there’s little to suggest that the Kremlin is unhappy with Igor Dodon, who was widely derided in European media as “Russia’s man”. After all, during the recent Victory Day parade, Putin welcomed Dodon to Moscow for the third time in less than six months (the Moldovan president had the dubious honour of being the only foreign leader in attendance.) Yet if we assume that, for the time being, Russia is encouraging Dodon in his flirtation with Plahotniuc, this should in turn, make the oligarch reconsider his choice of friends. 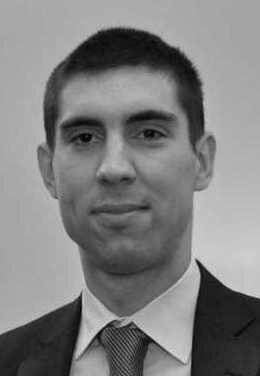 As always, it is the Moldovan people who ought to be worried the most, since they are ultimately affected by the lack of transparency in domestic politics and the lack of stability in foreign relations. Plahotniuc’s western partners are well aware of their friend’s shortcomings. Both the United States and the European Union condone Plahotniuc as long as he can ensure a steady pro-European course; provided that the democratic values trade off does not become too egregious. Knowing that his grip on power is contingent on external support, the oligarch spares no expense in lobbying Washington and Brussels. After making a failed strategic bid by employing the Podesta Group last year to whitewash his image in the United States, an increasingly determined Plahotniuc is doubling down by employing Burson-Marsteller to carry his water in Brussels. The famous public relations firm also counted Nicolae Ceaușescu and Viktor Yanukovych among its clients. With this change of the electoral rules, Moldova is moving to a bipolar political system in which Plahotniuc and Dodon will try to balance each other at the expense of all other political forces. The pretence of democracy will be maintained, but the political landscape will remain extremely unstable, and will be fiercely contested by Moldova’s remaining opposition parties. Ideally, parliamentary elections would offer Moldovans a way out, a cause for hope and, just possibly, for change. But unfortunately for those Moldovans who continue to demand real democracy, a new electoral system can only but stack the odds against them.